A Gusty Run and Late Night Window Trouble. A picture taken in fairer weather (last Monday!). The emerging shadow is my own of course! Ah, the joys of living on the most westerly tip of the most westerly rock in Europe. My last post here was all about March sunshine and a stroll to the beach, but last night the winds came... and boy how they came! D and I were awoken from our slumber at 5.30am last night to the sound of swirling and rattling from upstairs. I had inadvertently left a velux window open and it was rocking wildly, with the wind battering against the bedroom door! Of course, I did the brave thing by gently nudging my good wife out of bed to deal with this situation (I'm joking of course!). Anyway, the day cleared and all we were left with was the gusty residue of a big wind. The tail of a gale. And is there any weather nicer to run in than the tail of a gale? I did 5 miles today, something in the sub nine region. It was a slight improvement on Monday, so I'm happy with an upward curve, and I've made sure to close all windows tonight. On our way down to the secluded beach D and I passed our neighbour, Beartle's, raised beds. He is all set and ready for sowing vegetables - putting me to shame! The beautiful weather continued today, and as luck would have it I have been on a few days off from work - just at the right time. I went for a four mile run in Seanadh Mhach at lunch time. This is a beautiful trek through barron bogland and the place was awash with golden Spring rushes. For some reason I am still not 100% so I felt this run to be sluggish and slow - it may have something to do with the fact that I am still not meat-eating due to Lent, but this is hardly the case, as there are many vegetarian runners in the world. At least one cutter was eager for an early year - most people wouldn't cut turf (peat) until May at the earliest but this sprightly man was at it already! The little beach was full of empty shells, as the tide was out. When Deirdre came home we went for a walk down to our 'private beach'! Well, if truth be known it is not private, and definitely not ours either, but it may as well be, for though it is secluded and difficult to get to from the main road, it is but a short walk from where our house is situated. In olden times nuns would cross fields to bathe in this secret spot and it must have belonged to some man named Páidín, for it is still known as Trá Pháidín (Páidín's beach). Running-wise I seem to be in a cycle of short runs only. I had to cancel the Craughwell 10 mile run some weeks ago in order to do the Dublin 5k with the lads (happy to cancel though! ), and now I have to cancel the April 9th Connemara half marathon, as D and I must travel to London that weekend for a friend's celebration. Truth be known though, I'm not really bothered about racing long distance pre-Summer and I hope to add on the miles in finer weather. Late March Brings the Sun. I spotted the first sea-angler of the year on Salthill's prom this evening as I was out for a 5 mile, slow run. I doubt there are any mackerel to be caught, but my good friend James assures me that pollack are plentiful for those who know how to catch them. Late May is when we usually manage to get down to the rock for a cast or fifty, and when the mackerel are in you usually don't even need to know how to catch them - just keep casting your line and feathers and you're bound to land a few. Today was the best day of the year so far (weather-wise! ), and the prom was jam packed with walkers - not to mention the benches that were bulging with ice cream lickers. There were even swimmers and bathers - though I can't say that I would have braved the sea at this time of year! I ran very slowly, and really couldn't even put in a fast mile. I'm still feeling the residue of last week's cold - either that or my Lenten abandonment of meat is beginning to wear me down. Must get iron tablets. The One a Month Club hit the Capital for their March Run! Like some wild banditos looking for trouble, the One-a-Month Club rode into the big city today, taking a wife with them - and this time no one would be safe...! Yes folks, it was a great day for the men of the wild west as we travelled east in brilliant March sunshine to participate in a the St. Patrick's Dublin 5k. Kevin, Cormac and I were joined today by Cormac's wife, and my sis-in-law, Ruth. Pre-race tension builds on Dawson Street! There was a great buzz of excitement around the Mansion House with old and young runners stretching, chatting, jogging and doing just about everything that fit athletes do in those minutes before a big run. Of course, we do things a little differently in our family - so a sit down coffee break was called for just a half an hour before the start! This time last year I ran the Craughwell 10 miler with a cold and just ached my way through it. A year on, and I had a bloody cold again - this time though the worst of it was over. There were some famous faces to be seen all day - the great Irish miler, Eamonn Coughlan, the magnificent rugby player, Ronan O'Gara and one of Ireland's greatest marathon runners, Gerry Kiernan (with whom we got our picture taken). The Lord Mayor counted us down and we all set off towards St. Stephen's Green, heading towards Baggot Street. Kevin and I sat back at the start but Cormac and Ruth shot off, at varying speeds. The course from start to finish was more or less flat and a joy to run. Memories of last Autumn's Dublin marathon came flooding back as I watched the mass of runners making their way through city, being cheered by exuberant onlookers. Kevin and I ran at a chatting pace, not overly stretched but definitely not slow. We paced ourselves well and finished strongly, running at around an 8.30 pace. Cormac, who has only really started back training, was only a minute behind us, and Ruth wasn't far behind him - finishing the run well under the 30 minute mark. We had another coffee afterwards to toast our success, and to look forward to April's run (which we still need to find!). A glorious day for a run. I left work and drove towards the Prom to run my Mutton Island route - determined to stick with the policy of taking it easy for this time of year, as well as taking Running Fox's advice of adding a 'fast mile'. My pace was around 9.15ish as I started off in an area called the Claddagh - an old fishing village. Here I swung my little digital camera into action and snapped some lobster pots that were left up on the quay wall. I then headed out through South Park towards the Mutton Island causeway, with the old lighthouse and sewerage plant looming in the distance! The place was full of walkers and runners, with dogs on roller skates! Turning back from the Island I finally headed for th famous Prom. The sun was blinding above - though it was actually a chilly evening for anyone standing still! The walkers of Galway have a tradition of walking as far as the old wall by Blackrock, at which point they kick the wall and turn for home! This kick was my signal to up the pace and put in that 'fast mile' - it may have only been 3/4 of a mile, but it was fast...! I'd say I ran about 5 miles in all, and enjoyed every one of them! The 'one-per-month' racing plan is to head for Dublin this weekend, where Kevin, Cormac and I will compete in the Mansion House 5k. 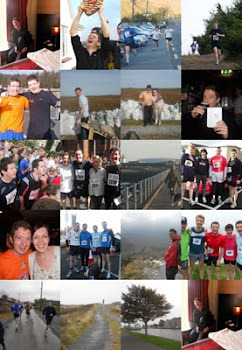 It means missing out on the Craughwell 10 miler in order to keep the Brother's quest going - but well worth it I think. My book tip today is Born to Run - a fantastic read about barefoot running in Mexico! Back to Basics with a Three Mile Run. Following nearly a week of inactivity, when I felt sorry for myself for not feeling 100%, I got out into the cold clear air yesterday to run three miles, down to the lighthouse in Point, back up to Cóilín Daddy's house and then back down home. What I call: the out the door and up and down run. I have resolved to do two things for this time of year: 1) slow down my training runs, 2) get out three times a week. I reckon my recent lethargy is down to the fact that I have run too sporadically and when I have gone out I have run to fast. The brain keeps telling me that I have already put in a year of hard running in 2010, culminating in a decent marathon, and that I should therefore have a base from which to run faster at the drop of the hat. But the body disagrees. So now I reckon this time of year is for one type of behaviour, and one type only: put in the long slow miles, enjoy the scenery and build the legs for summer training. One thing I'm looking forward to is to be able to pick up on some proper training this summer - I reckon I'll go for the furman first programme again that stood me in good stead last year - but I need to build that base first! Mutton Island... out on Galway Bay. There's a training route I love which I call the Mutton Island Run, and t'was that very run I did this evening. It starts on the prom, heading out towards the football pitches on South Park, with a detour that cuts through Galway Bay as we head out to Mutton Island. This evening was particularly beautiful, a slight chill the only clue that we were in March and not May. Mutton Island sits only 1.5km out on the bay and there is an old lighthouse there which is now encased in a sewerage treatment plant! My good old friend, Bill Scanlon, was the last lighthouse keeper on Mutton Island, stepping down reluctantly in the 1980s when the lighthouses of Ireland were all automated and unmanned. It's hard not to think of Bill as I run towards the Island - his father and grandfather were also lighthouse keepers there, so Bill spent many years lighting up that rock in the bay. The road that now leads runners and walkers out to the Island was only put in place about 8 years ago, when the sewerage plant was put in place - so some good comes from a pile of sh*t!. In Bill's day the only access was by boat and as I run close to the Island I get an impression of the incredible peace that the inhabitants must have had on beautiful days like these as the water flaps gently against the rock and the sound of the gulls and other birds are amplified in chorus; 'this is our spot - away with you'. And turning back is even better - now I can see what Bill and his young brother must have seen all those years ago as they played down by the rocks edge and viewed Galway from afar. The cathedral is prominent now, but back then this was Galway gaol, the docks are full of tank-like buildings but there are no great ships - many years ago the great liners pulled in here, and Salthill was surely a thinner line than the big blot of property that now stands on the horizon. But still, the City is beautiful from this distance and the gulls agree... The Mutton Island run keeps me going for about five miles, round South Park and back down the prom. I ran this slowly, but steadily - it's the best I can do for now. First Picture From Birr 10K! The good people who organised last Saturday's tough, but wonderful 10k run in Birr have just sent on a pic of me finishing (slightly over excited, I know)... I am indebted to Oisín, David and all the crew for this pic as I had left my own camera behind... I'm also hoping to get hard evidence pics of Kevin and Richie's participation! The Glorious Prom on a Fine Day for Cricket! I took advantage of a beautiful, bright Spring day by skipping off work a wee bit early to run the gorgeous Galway prom. Who knows where this weather came from, and who cares - it's about time we started getting some bit of good news around these parts. In fact, good news was the order of the day when the radio man said that Ireland beat England in the Cricket world cup in India. How shocking was that?! To put this into perspective I don't think it's any exaggeration to say that this would be like England beating Ireland in a game or Hurling. Or a three-legged cat chasing a Alsatian dog up a tree. Most of us know absolutely nothing about cricket, but the nation needs a lift now and I reckon it should be taken as a compliment by our English neighbours to know that it feels good to beat the best! As for my run: I did at least four, at a fair pace (around 8 minutes), with another mile warm down.